For the past couple of months, the iPhone game that Giz editors have been constantly playing against each other has been Words with Friends. I am now trying to switch everyone over to Carcassonne. Sure, it's based on a German board game, and there's never been a non-nerdy board game out of that country. But give me a chance here. 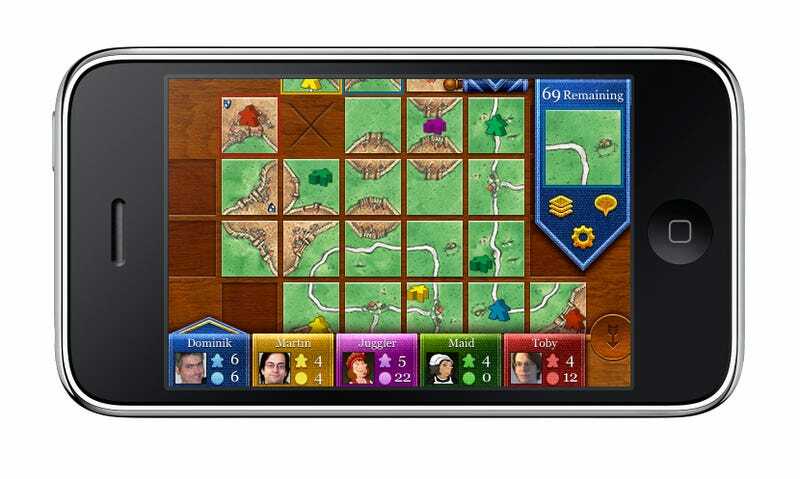 The game is basically perfectly suited to make the transition from tabletop to touchscreen. It consists of a bunch of square tiles, each with features of a map on it. Elements include parts of roads, parts of cities and cloisters. You take turns placing the tiles down to create a finished map. The actual competition comes in while you're making the map, as you're trying to complete various elements without letting your competitors complete theirs. So you're trying to build a big city or long road, while your opponents are trying to keep you from completing it or to hop on board to steal its points for themselves. The iPhone version is a perfect translation of the game, one that improves upon the original with a solitary mode, very good computer opponents and the ability to see just what tiles are left and what moves are and aren't possible. You can play either locally or online against friends or strangers, and a game can be banged out in about 10 minutes if you're playing against the computer or speedy opponents. It is incredibly fun.